Premier League clubs made by far the most money from Uefa’s central funds from the 2009-10 Champions League according to an analysis by sportingintelligence of recently released financial figures ahead of the 2010-11 group stage starting next week. Despite getting no further than the quarter-finals, Manchester United made €45.8m (£39.8m) from the competition in Uefa prize money (€17m), and from the “market pool” of TV cash (€28.8m). That €45.8m will head almost entirely to the bottom line at Old Trafford, and is money made before any European-related ticket, merchandise or sponsorship income is included. Only the competition winners, Internazionale, made more from the competition than United, earning €48.8m (£42.4m). Arsenal made €33.4m (£29m) from Uefa funds, Chelsea made €32m (£28m) and Liverpool made €28.9m (£25m) to give the four English clubs a total income from Uefa of €140.2m (£121.8m). Of this sum, €83m (£72m) was from the market pool cash, which was by far the biggest amount to clubs from any one country. Why? Because English clubs are bankable TV fodder, tend to draw bigger audiences, and are therefore more marketable and make more cash for Uefa. 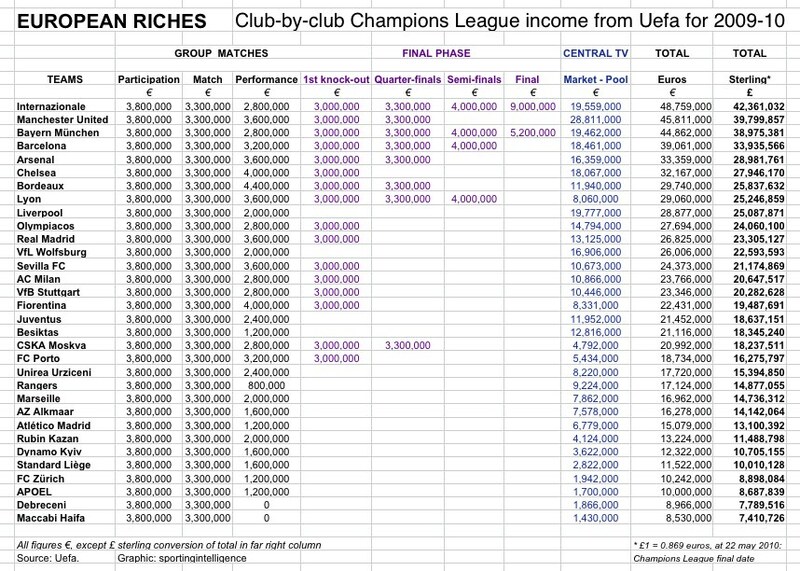 Our club-by-club table below shows precisely the amount of money that each team from the group stage onwards made from Uefa from the Champions League in 2009-10. Each of the 32 clubs earned €3.8m for reaching the group stage and another €3.3m for playing six group games. Performance bonuses varied depending on wins and draws, and then extra cash was dished out depending how far a team went in the knockout phase. The market pool money is divided by formula between participants from each nation. England was one of three nations with four teams in the competition from the group stage onwards. Italy and Spain were the others, while Germany and France each had three teams represented. Italy’s four teams were Inter, Milan, Fiorentina and Juventus, and collectively they earned £101m against the English quartet’s £121.8m, of which they earned £44m in market pool TV cash against England’s £72m. Spain’s four teams were Barcelona, Read Madrid, Sevilla and Atletico Madrid, and collectively they earned £91.5m against the English quartet’s £121.8m, of which they earned £42.6m in market pool TV cash against England’s £72m. Germany’s three teams were Bayern Munich (eventual runners-up), Wolfsburg and Stuttgart and collectively they earned £81.9m (£40.7m from the market pool). France’s three teams were Bordeaux, Lyon and Marseille, who earned £65m (£24.2m from the market pool).